Opencart Store Locator: A quick way for giving an effortless searching experience for the customers to locate the stores on the Google Maps. The stores in any number can be added by the admin panel from the back end, which will help the customers to find the stores based on Product search or Location search for best accurate results. The Google Map integration will help to locate various stores available for the selected product based on ajax search to find the nearest location, which helps to increase the user interface to make the search more responsive and easy. Opencart Store Locator - A quick way for giving an effortless searching experience for the customers to locate the stores on the Google Maps. The stores in any number can be added by the admin panel from the back end, which will help the customers to find the stores based on Product search or Location search for best accurate results. The Google Map integration will help to locate various stores available for the selected product based on ajax search to find the nearest location, which helps to increase the user interface to make the search more responsive and easy. Embedded Google maps for searching locations. oogle ajax based search to find the nearest location. 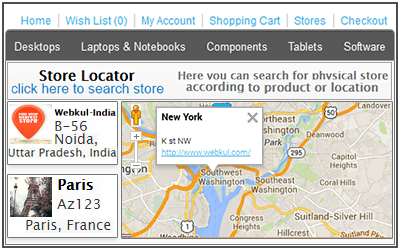 2 modes to search the store- either through Product search or Location search. Adding any number of store locations. Feature to redirect to store's website directly by attaching a URL. Direct link on the store to locate the stores near your location. Adding New Locations & Assigning products to store. Store address and logo of the seller. 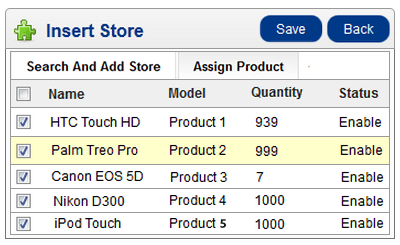 Assigning selected or all products to the store. Entering distance to search results from user location. The feature helps to locate the store automatically within the set distance limit in system configuration settings in the back end. The store list will show the distance of the respective store from the searched keyword/location, with all the store details. The search can be made with 2 ways- either through Product search mode or Location search mode. 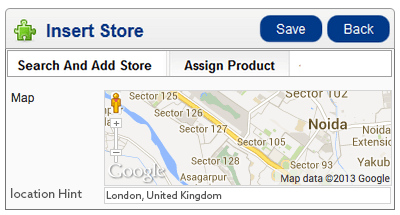 Did you buy Opencart Store Locator?